The Rockland Sofa Table is new in 2012 to the collection. It also follows the Asian look found in my other Rockland pieces with the tapered legs and curved aprons on all four sides. The underside of the long sides of the top have a cove detail closely following the radius of the curve on the apron. 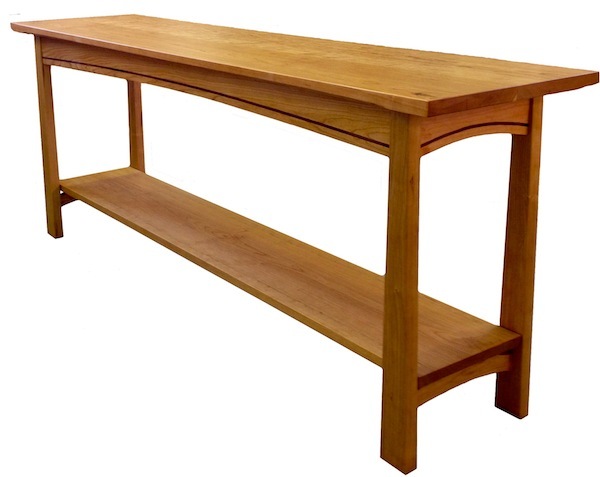 The Sofa Table shown is made from Cherry and accented with Walnut inlays on all four sides. Other wood types, combinations and sizes available. Please inquire. Click on photo for other views.